Find scenic parks, waterways, and other places to canoe in Staten Island. Whether you're a boating enthusiast or you're looking to enjoy a casual day on the waters with the family, here are some great venues to go canoeing on Staten Island. For the best in Staten Island canoeing, view Fun New York's definitive guide. 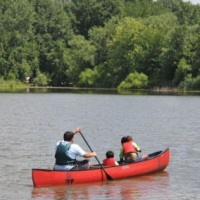 Canoeing and other Fun Activities in Staten Island! Home to hundreds of acres of wilderness and active recreation, Staten Island's Willowbrook Park is a top destination amongst locals in the borough. One of the most popular activities at this gorgeous park is canoeing. Enjoy an incredibly relaxing canoe ride as you feel the rhythm of the waves, the sun on your face, and the excitement of slicing through water. After you're done canoeing you can enjoy an outstanding array of other fun activities like hiking, tennis, bird watching, archery, baseball, dog runs, and picnicking. You can even take your children to the carousel!